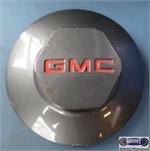 5084, CENTER CAP, 15", 94-97, GMC, JIMMY, SONOMA, DARK GREY WITH 3" NUT STYLE, RED GMC IN CENTER. 5 LUG NUT CLIPS, 6-7/8" DIA. 5084, Used Rims, 15x7, 5 LUG, 4-3/4", 98-02, CHEVY, GMC, BLAZER, SONOMA, S10, S15, 6 SLOT, RECESSED CENTER CAP.